The County Surveyor's office maintains Riverside's land records. These records include—but are not limited to—corner records [records documenting the placement of survey monuments], survey records, final parcel and tract maps, field notes, benchmarks, horizontal control, right-of-way records (such as vacations, street name changes, dedications), unrecorded maps (such as plans and right-of-way maps), and certificates of correction. 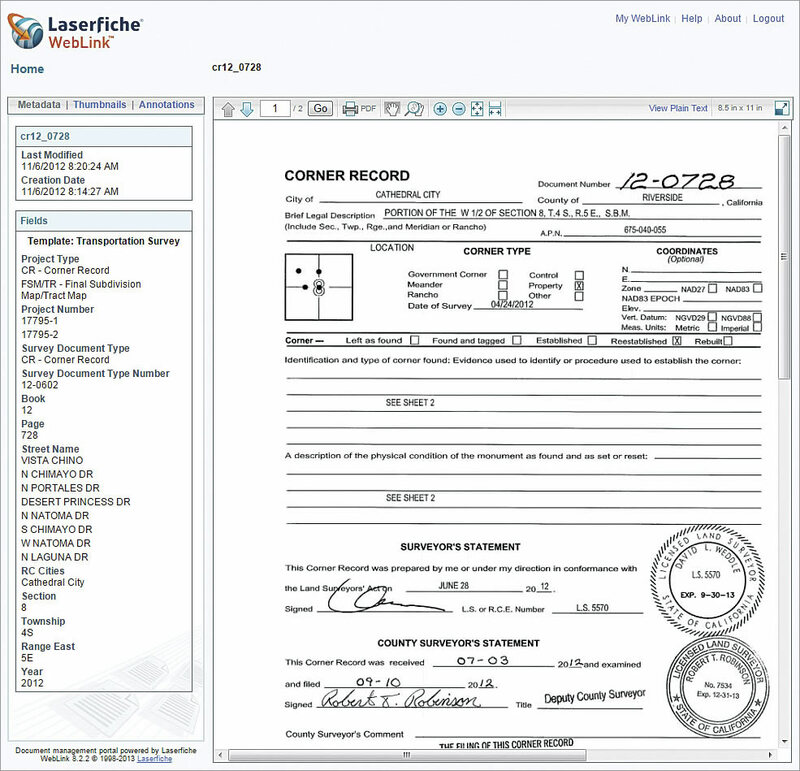 In 2009, that system was retired and replaced by an online scanned repository system called Laserfiche. 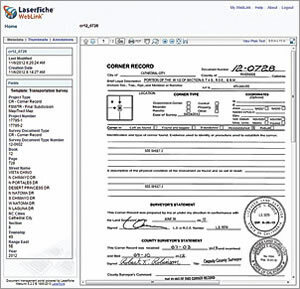 Laserfiche allows for querying the above-mentioned information using a variety of search terms such as street intersection; project number; map number; or section, township, and range. Although a much more user-friendly system that retrieves all the information related to search criteria entered and allows review of the documents, it's still a record-by-record search and, thus, inefficient. 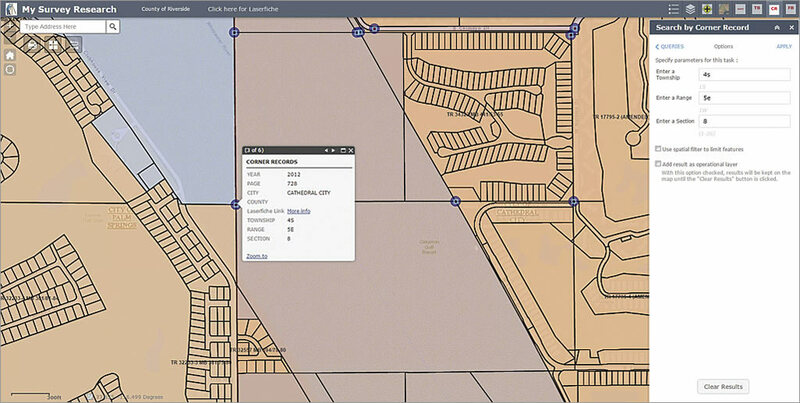 The County Surveyor's office created an in-house research interface that combines Laserfiche, ArcGIS for Server, and ArcGIS for Desktop into a single map. This map is used by survey staff and the Transportation Department and is shared at the county's public research counter. 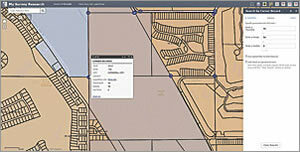 The County of Riverside's ArcGIS Online subscription included Web AppBuilder for ArcGIS, which let the county quickly build custom web maps with widgets and custom styles, then share and publish apps to internal groups and the public. Items in web maps can be linked to a website. Now anyone can conduct research from the office, field, or favorite coffee shop. The new system simplifies the land records investigation process maintained by the County Surveyor's office and will enable efficient research for years to come. David McMillan, a licensed land surveyor, has worked for the County of Riverside for more than 11 years. He currently supervises Geodetic Section & Counter Services, which is part of the Survey Division under the Transportation Department. McMillan obtained a bachelor's degree in geomatics engineering from California State University, Fresno and is currently a graduate student, pursuing a master's degree in GIS at the University of Redlands.